Sacrifice is the offering of food, objects or the lives of animals or humans to a higher purpose, in particular divine beings, as an act of propitiation or worship. While sacrifice often implies the ritual killing of an animal, the term offering (Latin oblatio) can be used for bloodless sacrifices of food or artifacts. For offerings of liquids (beverages) by pouring, the term libation is used. Scholars such as René Girard have theorized that scapegoating may account for the origins of sacrifice. The term usually implies "doing without something" or "giving something up" (see also self-sacrifice). But the word sacrifice also occurs in metaphorical use to describe doing good for others or taking a short-term loss in return for a greater power gain, such as in a game of chess. Animal sacrifice is the ritual killing of an animal as part of a religion. It is practiced by adherents of many religions as a means of appeasing a god or gods or changing the course of nature. It also served a social or economic function in those cultures where the edible portions of the animal were distributed among those attending the sacrifice for consumption. Animal sacrifice has turned up in almost all cultures, from the Hebrews to the Greeks and Romans (particularly the purifying ceremony Lustratio), Egyptians (for example in the cult of Apis) and from the Aztecs to the Yoruba. The religion of the ancient Egyptians forbid the sacrifice of animals other than sheep, bulls, calves, male calves and geese. Animal sacrifice is still practiced today by the followers of Santería and other lineages of Orisa as a means of curing the sick and giving thanks to the Orisa (gods). However, in Santeria, such animal offerings constitute an extremely small portion of what are termed ebos—ritual activities that include offerings, prayer and deeds. Christians from some villages in Greece also sacrifice animals to Orthodox saints in a practice known as kourbània. The practice, while publicly condemned, is often tolerated. Human sacrifice was practiced by various Pre-Columbian civilizations of Mesoamerica. 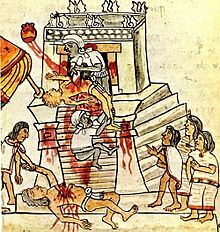 The Aztec in particular are known for the practice of human sacrifice, though most popular estimates are over-estimations, and sacrifice was practiced on a far larger scale in ancient China. Current estimates of Aztec sacrifice are between a couple thousand and twenty thousand per year. Some of these sacrifices were to help the sun rise, some to help the rains come, and some to dedicate the expansions of the great temple at Tenochtitlán (their capital). There are also accounts of captured Conquistadores being sacrificed during the wars of the Spanish invasion of Mexico. In Scandinavia, the old Scandinavian religion contained human sacrifice, as both the Norse sagas and German historians relate. See, e.g. Temple at Uppsala and Blót. There is evidence to suggest Pre-Hellenic Minoan cultures practiced human sacrifice. Corpses were found at a number of sites in the citadel of Knossos in Crete. The north house at Knossos contained the bones of children who appeared to have been butchered. The myth of Theseus and the Minotaur (set in the labyrinth at Knossos) suggests human sacrifice. In the myth, we are told that Athens sent seven young men and seven young women to Crete as human sacrifices to the Minotaur. This ties up with the archaeological evidence that most sacrifices were of young adults or children. Human sacrifice is no longer officially condoned in any country, and any cases which may take place are regarded as murder. We also present ourselves as sacrifice in union with Christ (Romans 12:1; 1 Peter 2:5) to be used by God in the work of redemption, reconciliation, and justice. In the Great Thanksgiving, the church prays: “We offer ourselves in praise and thanksgiving as a holy and living sacrifice, in union with Christ’s offering for us . . .” (UMH; page 10). A formal statement by the USCCB affirms that "Methodists and Catholics agree that the sacrificial language of the Eucharistic celebration refers to 'the sacrifice of Christ once-for-all,' to 'our pleading of that sacrifice here and now,' to 'our offering of the sacrifice of praise and thanksgiving,' and to 'our sacrifice of ourselves in union with Christ who offered himself to the Father.'" Roman Catholic theology speaks of the Eucharist not being a separate or additional sacrifice to that Christ on the cross; it is rather exactly the same sacrifice, which transcends time and space ("the Lamb slain from the foundation of the world") (Rev. 13:8), renewed and made present, the only distinction being that it is offered in an unbloody manner. The sacrifice is made present without Christ dying or being crucified again; it is a re-presentation to God, of the "once and for all" sacrifice of Calvary by the now risen Christ, who continues to offer himself and what he has done on the cross as an oblation to the Father. The complete identification of the Mass with the sacrifice of the cross is found in Christ's words at the last supper over the bread and wine: "This is my body, which is given up for you," and "This is my blood of the new covenant, which is shed...unto the forgiveness of sins." The bread and wine, offered by Melchizedek in sacrifice in the old covenant (Genesis 14:18; Psalm 110:4), are transformed through the Mass into the body and blood of Christ (see transubstantiation; note: the Orthodox Church and Methodist Church do not hold as dogma, as do Catholics, the doctrine of transubstantiation, preferring rather to not make an assertion regarding the "how" of the sacraments), and the offering becomes one with that of Christ on the cross. In the Mass as on the cross, Christ is both priest (offering the sacrifice) and victim (the sacrifice he offers is himself), though in the Mass in the former capacity he works through a solely human priest who is joined to him through the sacrament of Holy Orders and thus shares in Christ's priesthood as do all who are baptized into the death and resurrection of Jesus, the Christ. Through the Mass, the merits of the one sacrifice of the cross can be applied to the redemption of those present, to their specific intentions and prayers, and to the release of the souls from purgatory. For Lutherans, the Eucharist is a “sacrifice of thanksgiving and praise…in that by giving thanks a person acknowledges that he or she is in need of the gift and that his or her situation will change only by receiving the gift”. Some Protestants, excluding Methodists, Lutherans and many Anglicans, reject the idea of the Eucharist as a sacrifice, inclining to see it as merely a holy meal (even if they believe in a form of the real presence of Christ in the bread and wine, as Reformed Christians do). The more recent the origin of a particular tradition, the less emphasis is placed on the sacrificial nature of the Eucharist. The Catholic/Orthodox response is that the sacrifice of the Mass in the New Covenant is that one sacrifice for sins on the cross which transcends time offered in an unbloody manner, as discussed above, and that Christ is the real priest at every Mass working through mere human beings to whom he has granted the grace of a share in his priesthood. As priest carries connotations of "one who offers sacrifice", some Protestants, with the exception of Anglicans and Lutherans, usually do not use it for their clergy. Evangelical Protestantism emphasizes the importance of a decision to accept Christ's sacrifice on the Cross consciously and personally as atonement for one's individual sins if one is to be saved—this is known as "accepting Christ as one's personal Lord and Savior". The Orthodox Church sees the celebration of the Eucharist as a continuation, rather than a reenactment, of the Last Supper, as Fr. John Matusiak (of the OCA) says: "The Liturgy is not so much a reenactment of the Mystical Supper or these events as it is a continuation of these events, which are beyond time and space. The Orthodox also see the Eucharistic Liturgy as a bloodless sacrifice, during which the bread and wine we offer to God become the Body and Blood of Jesus Christ through the descent and operation of the Holy Spirit, Who effects the change." This view is witnessed to by the prayers of the Divine Liturgy of St. John Chrysostom, when the priest says: "Accept, O God, our supplications, make us to be worthy to offer unto thee supplications and prayers and bloodless sacrifices for all thy people," and "Remembering this saving commandment and all those things which came to pass for us: the cross, the grave, the resurrection on the third day, the ascension into heaven, the sitting down at the right hand, the second and glorious coming again, Thine own of Thine own we offer unto Thee on behalf of all and for all," and "… Thou didst become man and didst take the name of our High Priest, and deliver unto us the priestly rite of this liturgical and bloodless sacrifice…"
The Sanskrit yajna (yajña, modern Hindi pronunciation: yagya) is often translated as "sacrifice" (also "offering, oblation", or more generically as "worship"). It is especially used to describe the offering of ghee (clarified butter), grains, spices, and wood into a fire along with the chanting of sacred mantras. The fire represents Agni, the divine messenger who carries offerings to the Devas. The offerings can represent devotion, aspiration, and seeds of past karma. In Vedic times, yajna commonly included the sacrifice of milk, ghee, curd, grains, and the soma plant—animal offerings were less common. In modern times, yajna is often performed at weddings and funerals, and in personal worship. Sacrifice in Hinduism can also refer to personal surrender through acts of inner and outer worship. The Qur'an states that the sacrifice has nothing to do with the blood and gore (Qur'an 22:37: "It is not their meat nor their blood that reaches God. It is your piety that reaches Him..."). Rather, it is done to help the poor and in remembrance of Abraham's willingness to sacrifice his son Isaac at God's command. Ritual sacrifice was practiced in Ancient Israel, with the opening chapters of the book Leviticus detailing parts of an overview referring to the exact methods of bringing sacrifices. Although sacrifices could include bloodless offerings (grain and wine), the most important were animal sacrifices. Blood sacrifices were divided into burnt offerings (Hebrew: עלה קרבנות) in which the whole unmaimed animal was burnt, guilt offerings (in which part was burnt and part left for the priest) and peace offerings (in which similarly only part of the undamaged animal was burnt and the rest eaten in ritually pure conditions). The teachings of the Torah and Tanakh reveal the Israelites's familiarity with human sacrifices, as exemplified by the near-sacrifice of Isaac by his father Abraham (Genesis 22:1-24) and some believe, the actual sacrifice of Jephthah's daughter (Judges 11:31-40), while many believe that Jephthah's daughter was committed for life in service equivalent to a nunnery of the day, as indicated by her lament over her "weep for my virginity" and never having known a man (v37). The king of Moab gives his firstborn son and heir as a whole burnt offering, albeit to the pagan god Chemosh. In the book of Micah, one asks, 'Shall I give my firstborn for my sin, the fruit of my body for the sin of my soul?' (Micah 6:7), and receives a response, 'It hath been told thee, O man, what is good, and what the LORD doth require of thee: only to do justly, and to love mercy, and to walk humbly with thy God.' (Micah 6:8) Abhorrence of the practice of child sacrifice is emphasized by Jeremiah. See Jeremiah 7:30-32. Wikimedia Commons has media related to Sacrifice. ^ Cowdell, Scott; Fleming, Chris; Hodge, Joel, eds. (2014). Violence, Desire, and the Sacred. Violence, Desire, and the Sacred. 2: René Girard and Sacrifice in Life, Love and Literature. Bloomsbury Publishing. ISBN 9781623562557. Retrieved 2016-06-01. ^ Harper, Douglas. "sacrifice". Online Etymology Dictionary. Retrieved 2015-08-23. ^ Helm, Sarah (17 June 1997). "Amsterdam summit: Blair forced to sacrifice powers on immigration". The Independent. London. Retrieved 23 May 2010. ^ introduction, Herodotus ; translated by Robin Waterfield ; with an; Dewald, notes by Carolyn (2008). The histories (1a ed. 1998; reimpr. 2008. ed.). Oxford: Oxford University Press. ISBN 978-0-19-953566-8. ^ Dodds Pennock, Caroline, 2012. Mass murder or religious homicide? Rethinking human sacrifice and interpersonal violence in Aztec society. Historical Social Research 37(3):276-302. ^ Stager, Lawrence; Samuel. R. Wolff (1984). "Child sacrifice in Carthage: religious rite or population control?". Journal of Biblical Archeological Review. January: 31–46. ^ a b c This Holy Mystery, Study Guide: A United Methodist Understanding of Holy Communion. The General Board of Discipleship of The United Methodist Church. 2004. p. 9. ^ a b O'Malley, Timothy P. (7 July 2016). "Catholics, Lutherans and the Eucharist: There's a lot to share". America Magazine. Retrieved 13 April 2018. ^ Methodist-Catholic Dialogues. United States Conference of Catholic Bishops and The General Commission on Christian Unity and Interreligious Concerns of The United Methodist Church. 2001. p. 20. ^ Losch, Richard R. (1 May 2002). A Guide to World Religions and Christian Traditions. Wm. B. Eerdmans Publishing. p. 90. ISBN 9780802805218. In the Roman Catholic Church the official explanation of how Christ is present is called transubstantiation. This is simply an explanation of how, not a statement that, he is present. Anglicans and Orthodox do not attempt to define how, but simply accept the mystery of his presence. ^ Neal, Gregory S. (19 December 2014). Sacramental Theology and the Christian Life. WestBow Press. p. 111. ISBN 9781490860077. For Anglicans and Methodists the reality of the presence of Jesus as received through the sacramental elements is not in question. Real presence is simply accepted as being true, its mysterious nature being affirmed and even lauded in official statements like This Holy Mystery: A United Methodist Understanding of Holy Communion. ^ Subramuniyaswami, Satguru Sivaya (2003). Dancing With Siva: Hinduism's Contemporary Catechism. Himalayan Academy Publications. ISBN 0-945497-96-2. p. 849. ^ "Indeed the offering of milk into the fire was more common than animal offerings." Flood, Gavin (1996). An Introduction to Hinduism. Cambridge University Press. ISBN 0-521-43878-0. p. 359. ^ "Online Qurbani". 1 November 2012. Archived from the original on 4 November 2012. Aldrete, Gregory S. 2014. "Hammers, Axes, Bulls, and Blood: Some Practical Aspects of Roman Animal Sacrifice." Journal of Roman Studies 104:28–50. Bataille, Georges. 1989. Theory of Religion. New York: Zone Books. Bloch, Maurice. 1992. Prey into Hunter: The Politics of Religious Experience. Cambridge, UK: Cambridge Univ. Press. Bubbio, Paolo Diego. 2014. Sacrifice In the Post-Kantian Tradition: Perspectivism, Intersubjectivity, and Recognition. SUNY Press. Burkert, Walter. 1983. Homo Necans: The Anthropology of Ancient Greek Sacrificial Ritual and Myth. Translated by P. Bing. Berkeley: Univ. of California Press. Burkert, Walter, Marcel Sigrist, Harco Willems, et al. 2007. "Sacrifice, Offerings, and Votives." In Religions of the Ancient World: A Guide. Edited by S. I. Johnston, 325–349. Cambridge, MA: Belknap. Carter, Jeffrey. 2003. Understanding Religious Sacrifice: A Reader. London: Continuum. Davies, Nigel. 1981. Human Sacrifice: In History and Today. London: Macmillan. Faraone, Christopher A., and F. S. Naiden, eds. 2012. Greek and Roman Animal Sacrifice: Ancient Victims, Modern Observers. Cambridge, UK: Cambridge Univ. Press. Feeney, Denis. 2004. "Interpreting Sacrificial Ritual in Roman Poetry: Disciplines and their Models." In Rituals in Ink: A Conference on Religion and Literary Production in Ancient Rome Held at Stanford University in February 2002. Edited by Alessandro Barchiesi, Jörg Rüpke, and Susan Stephens, 1–21. Stuttgart: Franz Steiner. Heinsohn, Gunnar. 1992. "The Rise of Blood Sacrifice and Priest-Kingship in Mesopotamia: A 'cosmic decree'?" Religion 22, no. 2: 109. Hubert, Henri, and Marcel Mauss. 1964. Sacrifice: Its Nature and Function. Translated by W. Hall. Chicago: Univ. of Chicago Press. Jensen, Adolf E. 1963. Myth and Cult Among Primitive Peoples. Chicago: University of Chicago Press. Kunst, Jennifer W., and Zsuzsanna Várhelyi, eds. 2011. Ancient Mediterranean Sacrifice. Oxford: Oxford Univ. Press. McClymond, Kathryn. 2008. Beyond Sacred Violence: A Comparative Study of Sacrifice. Baltimore: Johns Hopkins Univ. Press. Mylonopoulos, Joannis. 2013. "Gory Details? The Iconography of Human Sacrifice in Greek Art." In Sacrifices humains. Perspectives croissées et répresentations. Edited by Pierre Bonnechere and Gagné Renaud, 61–85. Liège, Belgium: Presses universitaires de Liège.